Goodmorning, peeps! Not a lot has changed on my desk from last week except the addition of some shopping we did while in the city for Bob's birthday last week. 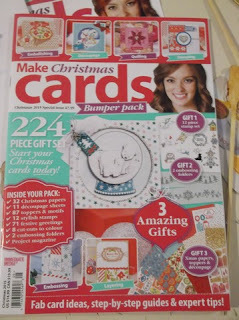 A trip to the city always means a stop at B & N. I picked up the newest copy of Scrap & Stamp as well as one of the UK mags. I will be playing with those adorable polar bears soon. 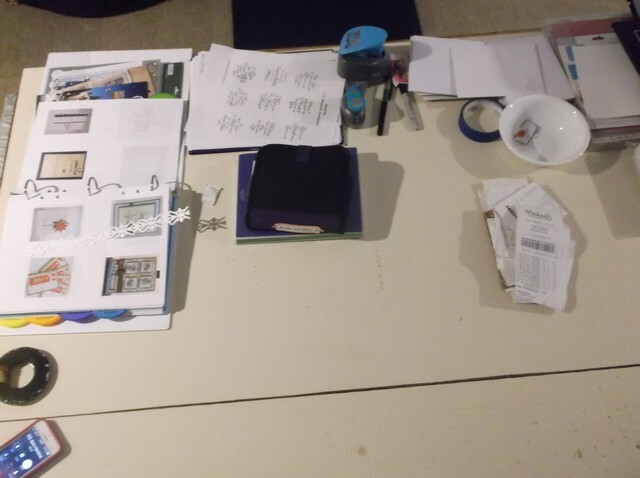 That's my desk? What's on yours? I can't wait to peek but Bob is home for a few more days so I might be late again getting 'round. But leave your number and you'll be first on my list. Last week, our assignment was to begin sorting our paper. I had most all of mine sorted from the fall class last year in preparation for the move (that took a year LOL). 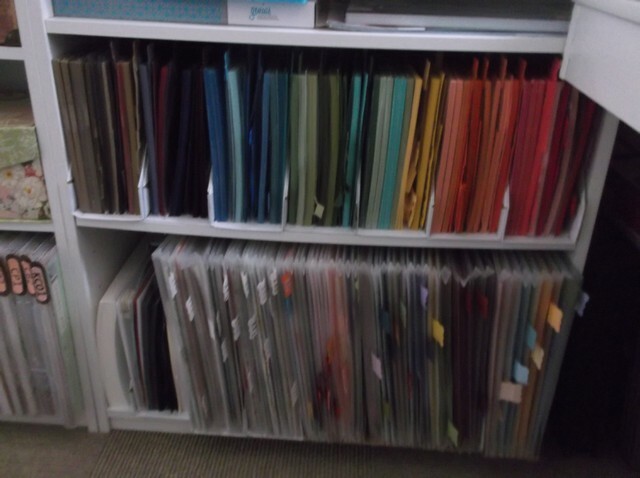 I have learned through the challenge that I like storing my cardstock by the Rainbow as opposed to color family. The top shelf is all SU Cardstock 8.5x11. 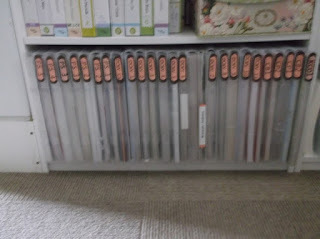 The bottom shelf is GP White, SU Black as well as what I have left in SU 12x12 and the SU Designer Paper (DP). This shelf is all of my Slabs - DCWV,, Paper Studio and Craft Paper. One of the discussions that always comes up when talking about the ScrapRack is 'should I tear my slabs apart?' The best answer is NO. The concept behind the ScrapRack is to store things together that you will use together. 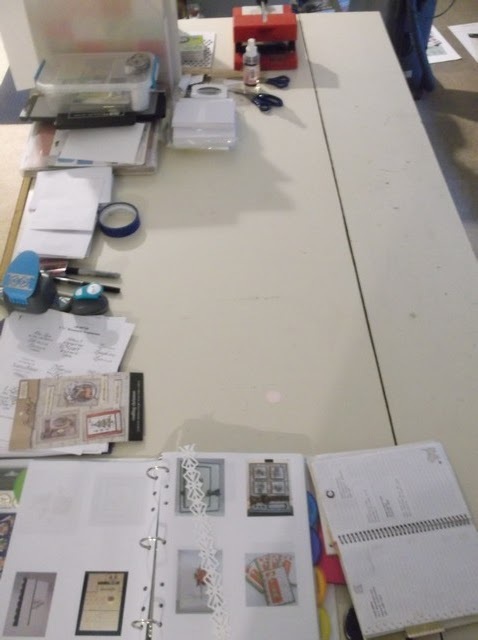 Most slabs are a theme within themselves... so you will use those papers together on your projects. So that I have a reference of what I have taken a picture of the cover of each slab. As soon as I have an ink cartridge for the photo printer, I will print them out as a 4x6 photo. These will store in the pockets of the Perfect Six page, giving me a visual reminder of each slab I have here. I will cover these boxes with fabric to match the studio. I'm a flipper and this works for me. 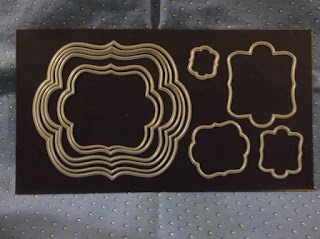 Divider tab made from a plastic place mat. 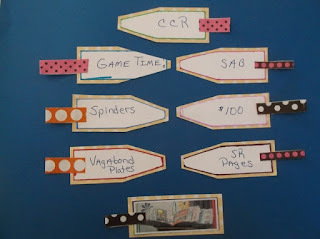 Because I don't have a lot of pages per theme, I plan to move these to the ScrapRack in their specific categories. 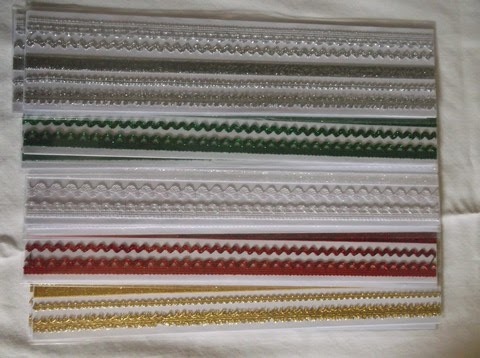 I am going to keep the Christmas paper stored like this as I have a lot of Christmas papers. I have pictures of my scrap rack as it's shaping up but they are on my phone. I'll have pictures of that soon. 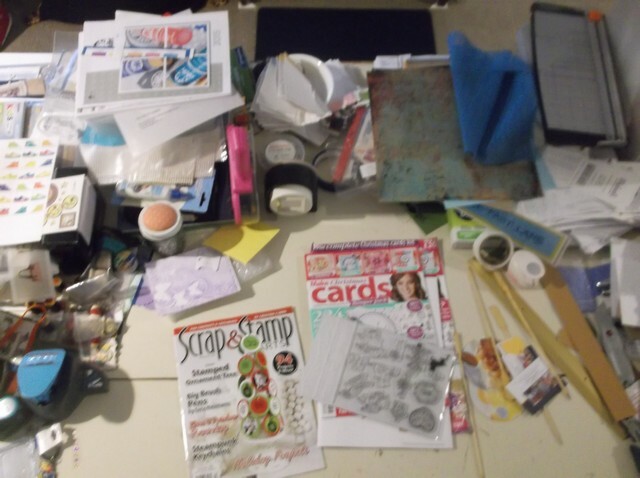 I can't believe how much more space I have within the studio now that I'm storing about 90% in the ScrapRack. The key is finding what works for you. I am a flipper so file storage and book page style work best for me. And because I've accomplished Week 2, I get my Reward... $50 in my Travel bank! What is working for you? Please share! Last Thursday was Bob's birthday. He wanted to go to Springfield to shop for a gun barrel. His birthday wish put me in proximity to lots of shopping options. 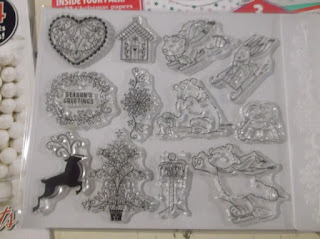 I did 'shop with intent' as I'm learning with the S2S thread on Splitcoast Stampers and through the ScrapRack. 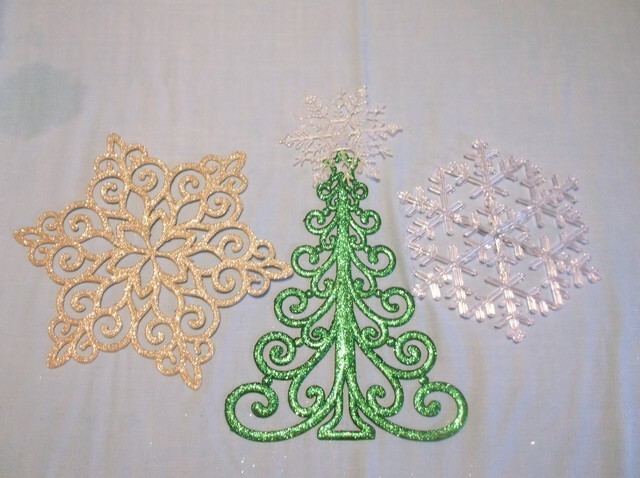 I'm building my stencil supply and couldn't pass up these lacy designs in the Christmas section at DEALS. 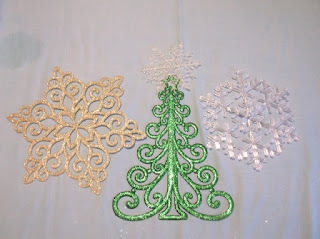 Over time I'm sure the glitter will flake off but that will not hurt the stencil any. 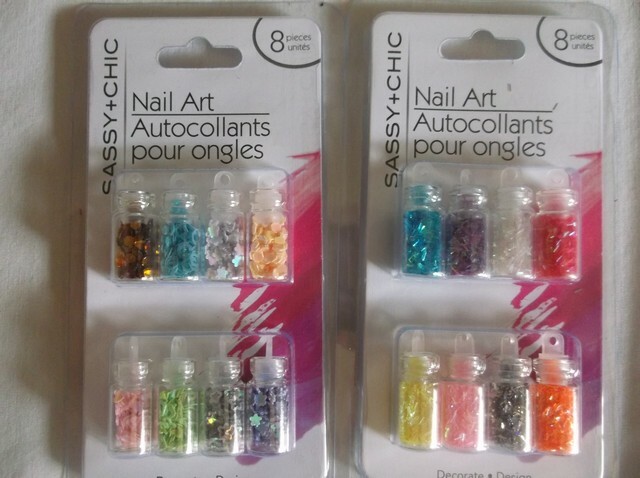 These are actually tiny vials of nail art. There are punch shapes, angel hair flakes, fine glitter, micro beads and chunky glitter. 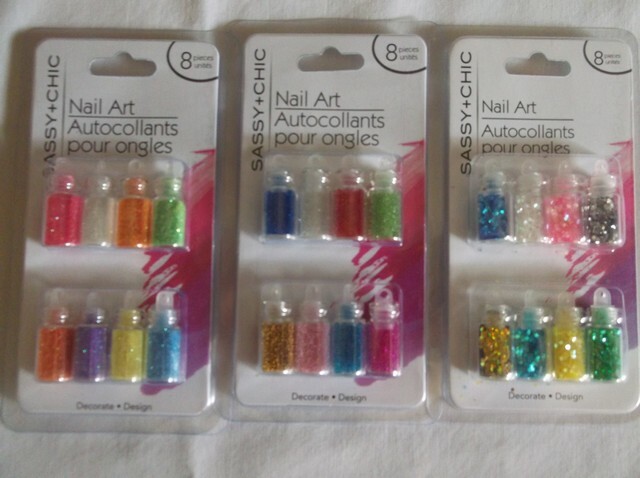 I found these at Dollar Tree and my first thought was cute additives for shaker cards. I picked up several of each.. Some will be included in a Spring Giveaway coming up after the new year. 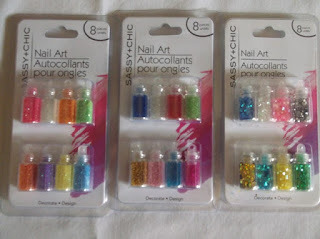 I got these from the $1.50 tower bins at Michaels. They are adhesive border strips in pretty metallic. 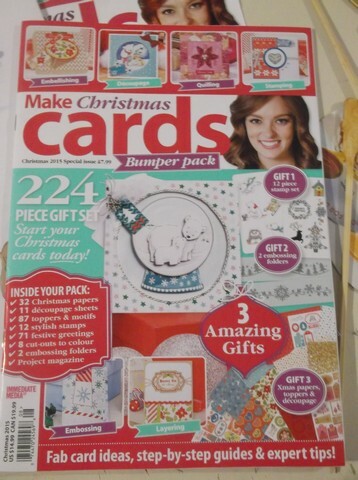 They'll be awesome on cards or decorating my planner. I bought one of each of the colors available. 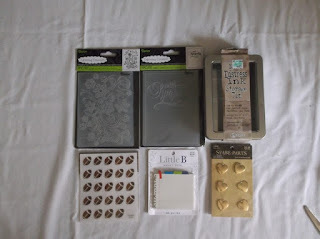 Everything in this picture came from Hobby Lobby except the embossing folders. Not sure why they got in this picture. LOL I bought a 4-pack of Tim's distress ink spots at Michaels a couple of weeks ago on their Halloween 50% off (which is still going on in case you want to make a trip). So I needed the tin. 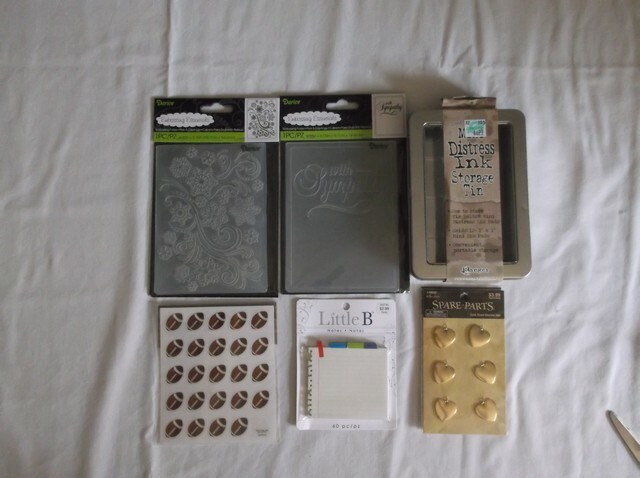 The foot ball stickers and notepad will go in with my planner stuff. 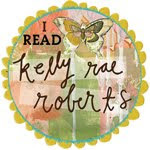 The heart charms I picked up in case I do any more book promotions. 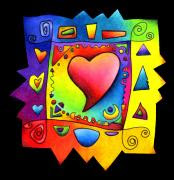 Just wondering where these hearts were at when my book came out last year. They would be perfect as a give away since a heart on a chain is a token in the book. I thought both of these would be great for a more elegant style card. I always pick up 5 packs of the Studio G pop dots when I'm at Michaels. I won't run out for awhile. 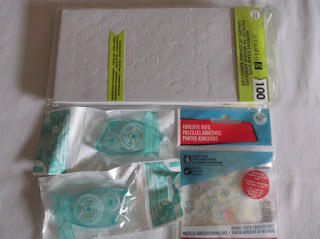 The smaller tape runners and package of glue dots are for my planner kit. And lastly, I found these cute candy-stripe med. clothes pins and the gold washi tape at TJ Max. I plan to string the clothes pins on twine for hanging our Christmas cards this year. In past years we have always taped them around the doorway of the living room. Between the blower for the heat kicking on and the cats thinking everything belongs to them, this is no longer an option. The clothespins will be perfect. And if you think that's all the washi tape I came home with... well.... The rest I'll be showing in a planner post later. I will tell you two things. DEALS had an excellent selection. TARGET has a new stash hitting their $1 bins. If they've not materialized yet, they are in the back room waiting to be put out. I found an errant one in the office supply and the guy checked... only to inform me it hadn't come out yet and that someone had probably picked that one up at another target and brought it back to this store. 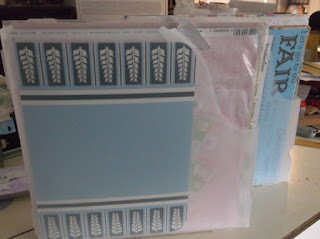 Hmmm... why would anyone buy Washi then RETURN it? 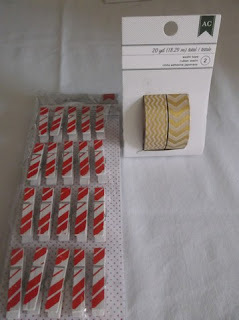 LOL Whatever.. just if you are into Washi... keep an eye on your local Target $ bins. That's all I have for today. I'm already behind on stuff.. as is usually the case when Bob is home. But I wouldn't trade my time with him for anything on this computer. Life is too precious. Good morning! Would you like a cup of coffee? As you can see, there is a bit of room at the desk for us. Actually, this is the big island in the center of the room that seems to have become my work station. Not a lot of change from last week. In the foreground you will see (L to R) new Sharpie Pens. They've come out with a 4-pack black, red, blue, green! Other stuff below there I'll be showing in another post. Next to that are the 2016 2-pg monthly pages for my 2016 planner. 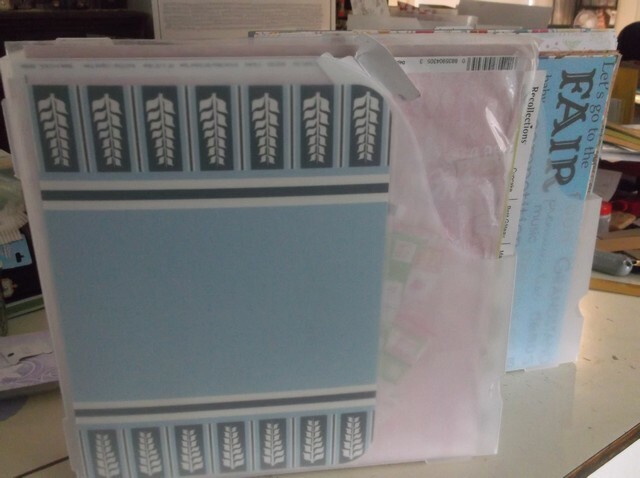 I'm on the hunt for the binder to use but otherwise everything else is ready for a separate post. 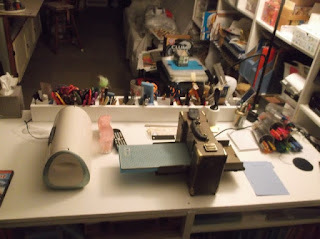 Next to that is my tool caddy to keep things off the work surface and in reach. Aside from that, everything is pretty much the same as last week. 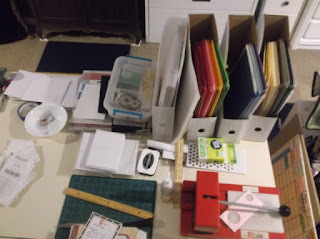 All the card making supplies out so I can make one here and there when I need a break from the computer. 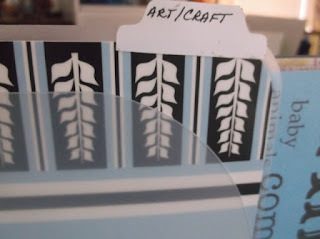 The whole purpose of this area was so I could leave my Cricut and Vagabond out all the time, ready for use. Below the Vagabond you can just see the shelf where I keep all of my cutting pads. You will get a better look at this area when I give a studio tour in a couple of weeks. We're almost THERE! Oh, don't wash your cup! I'll take care of that. You have lots more studios to peek in on. Hop on over to Julia's at Stamping Ground to pick up your travel itinerary. Have Fun! 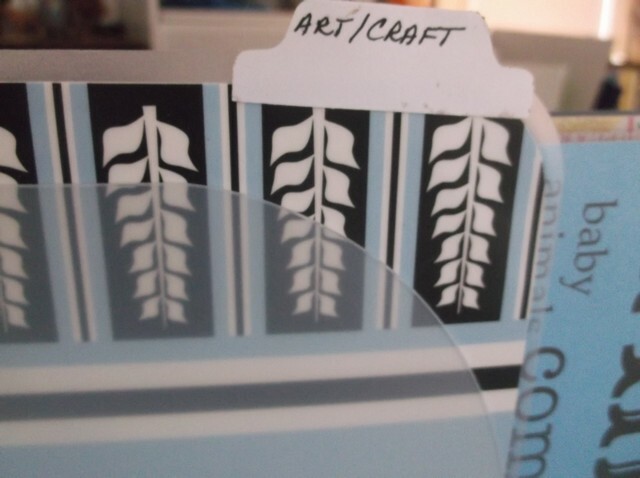 We are always looking for new ways to organize our crafting supplies. 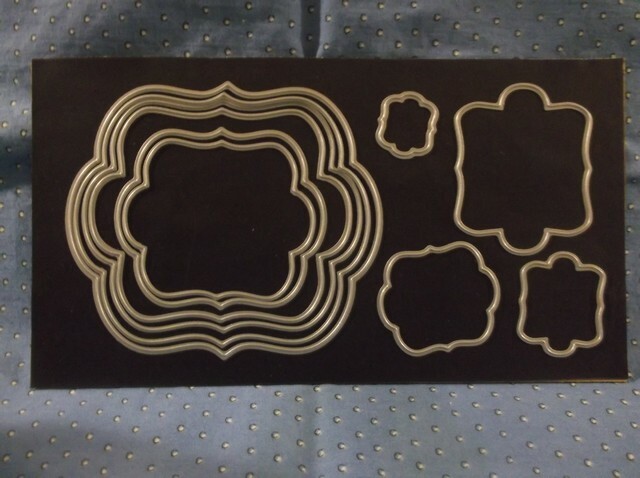 These thin dies seem to be a challenge. We need an easy access to them without worrying about them getting warped or bent. I am just getting started with these dies so I don't have a lot... only 8 sets, in fact. But I only buy things I know I will get multiple uses from. I got the idea for this storage from Tiffany Spaulding and crew at The Scrap Rack. 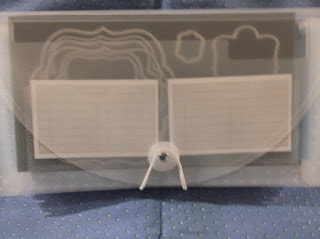 Last year she came out with the Die-Namic Storage and I fell in love with the concept... except for one small issue. 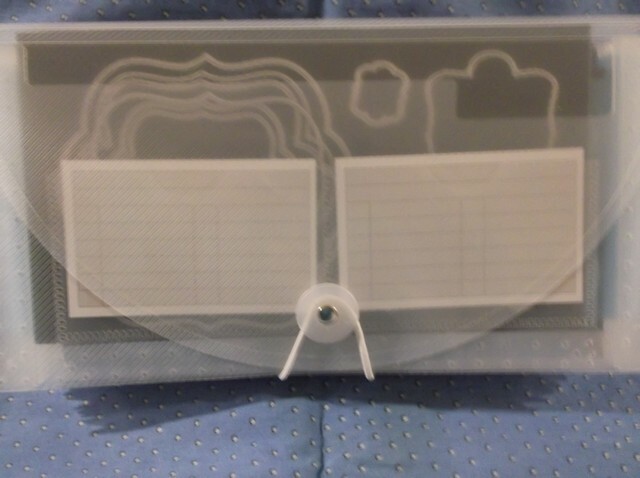 The die storage sheets are tacky, like the old 'magnetic' photo albums. I saw a potential problem with this (for me personally). 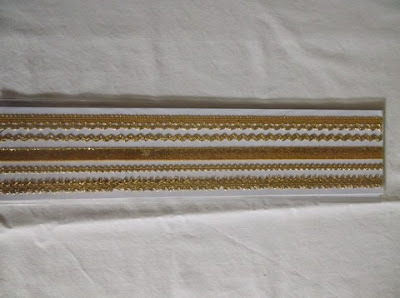 The tackiness may wear out after a few times of removing/ replacing the dies. What I do like about the Die-Namic storage is the slender, flip style of the pockets. 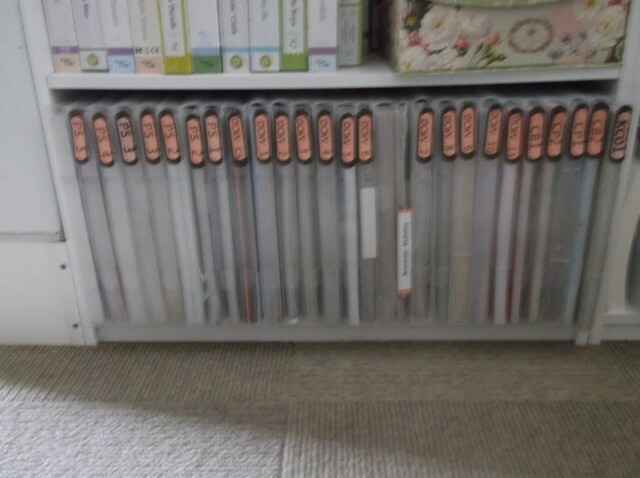 A couple of other companies, such as ArtBin, use magnetic sheets for storing the dies. I liked this idea much better so I decided to combine the two into a less-expensive version of both. 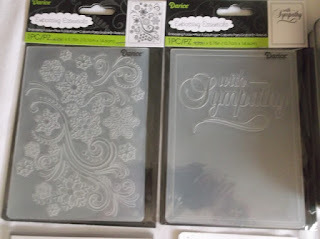 I chose the gusseted similar to these from Office Depot. These run just under $6. I know you can buy these at $ Tree but I wanted something a bit more sturdy and as I won't need 10 or 12 (as I know some of you might hehe), I opted to pay more for durability. I cut each sticky-backed sheet 8.5 x 4.75 and adhered to a sheet of chip board (recycled from backs of tablets and other sources). There is room in the pocket behind the mat sheet for any recipe/ description sheets from the packaging. I can slide these on the shelf below my cutting station 'book' style, taking up less than 1.5" of space on the shelf! This is one of many 'new' organizational ideas I'll be sharing in the coming weeks as I finish putting the new studio space together. 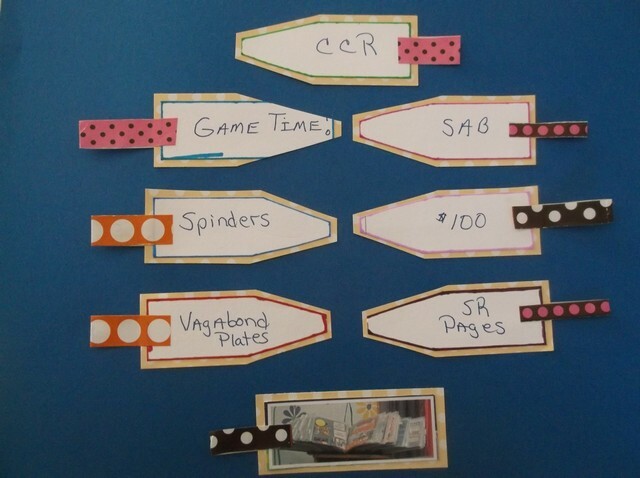 FRIDAY FREEBIE - The Scrap Rack Get Organized Challenge Fall 2015! The ScrapRack Organized Fall Class has begun. Tuesday was our first of six lessons. One of our assignments was to create our Big Benefits Board. These are the GOALS we want to accomplish over the next six weeks AND set a REWARD for each of those GOALS. begin to gather all of our supplies. I don't know how Tiffany is squishing these 8 into 6 classes but since I've been through this class three or four times already, I have a handle on a lot of things. I just need to get stuff put into the rack. Although I didn't complete all of the challenges AT THE TIME, over the course of putting the studio together I've acquired all of the items. So this time around I have different rewards. The travel money is important as I am planning several trips in 2016 so starting to stash that cash back now. And for completing all 6 lessons - something I've never done before, I'm rewarding myself $200 in Travel Cash. I'm posting this on our 2011 Get Organized Challenge FB page then hanging the constant reminder to keep me moving forward. Are you getting organized? Share what you are doing to make your space more inviting and inspiring! Good morning and happy WOYWW from a very chilly Ozarks region of MO. We are at 45 degrees F. The day has promise to be gorgeous as I watch the sun top the trees. I have laundry ready to go on the line and a house to clean. 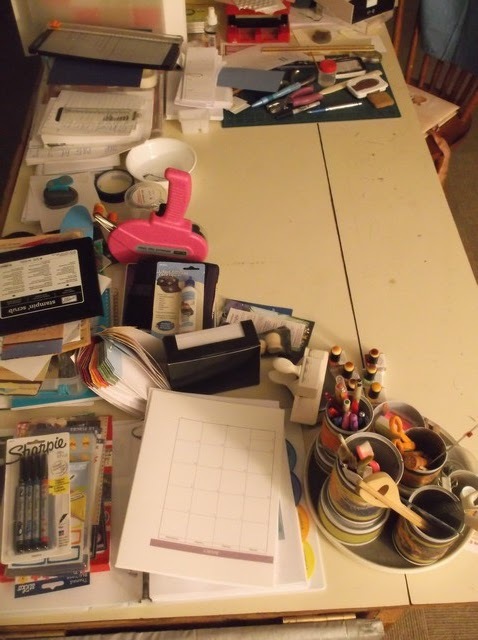 When you are done visiting me in the Ozarks, please hop on over to Stamping Ground where Miss Julia has a long list of other studios you can peek into. No standing on an up-turned milk pail to look in the window. We open the doors wide and welcome you. My desk hasn't changed a lot since last week. The CD binder and photo album beneath has all of my digi images. 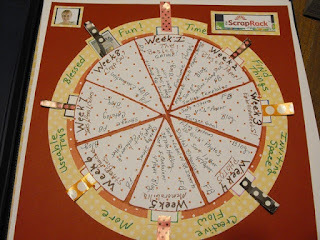 Brenda, over at Disney Girl offered up a challenge for us to beat her to participating in the October challenge at Scrapbook Blessings. Anything goes but the optional is to use ONLY a digi image. I thought this was a good one to play with. The stack of receipts to the right need to be logged into my Stamp 2 Spend check register. Goal is to track how much we spend, thus encouraging us to use more of what we have. 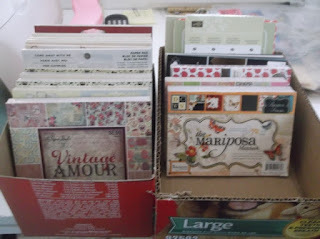 We 'pay' ourselves for making cards, scrapbook LOs, etc... using what we have before buying new. I know I am so in the RED that I've avoided tracking for a very long time. Determined to do that today. This is the other end of the work island. Nothing exciting. 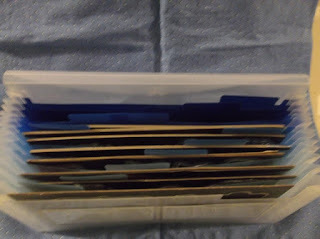 Tub of various adhesives, my paddle sizzix for when I just need one of something. This is temporary until I get my cutting station fully set up. 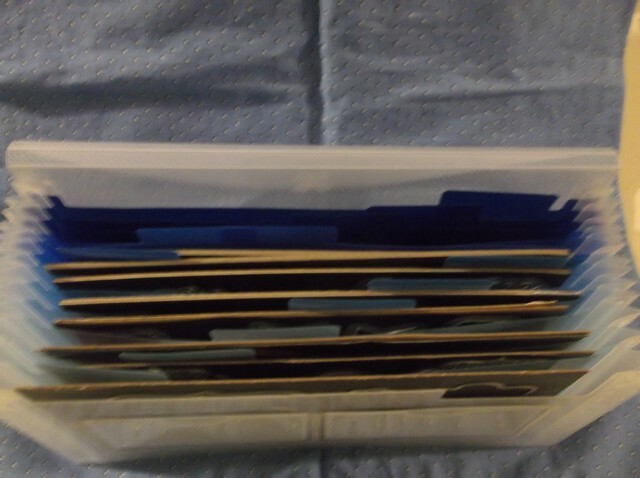 The paper holders are all of my Recollections cardstock. I use that on cards I know people are just going to toss. There.. I've shown you mine. Let's see yours. I love snooping in to see what everyone else is working on. 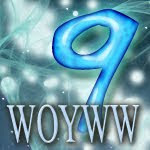 WOYWW #331 - Merry Christmas! Each Wednesday we join Miss Julia over at Stamping Ground to open up the doors to our studios and let you see what we are working on. We are always looking for new workspaces to snoop through, so join us! We'd love to have you. 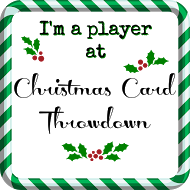 I'm jumping in this week because I actually made a card (see yesterday's post) and I actually have a surface to work on again. Yay! Everything you see here is laid out in preparation for making my Christmas cards. 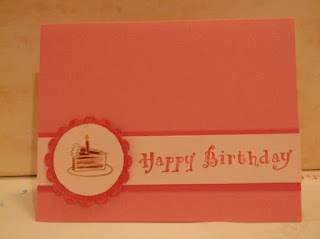 I wanted to do them on Saturday for National Card Making Day but I wound up just working on the card list instead. My silly OCD won't let me do anything until all the components are in place. Quick photo tour. The ring binder in the foreground is where I keep all the card ideas I've saved from SCS and Pinterest. I try to label them with the original designer so I can credit them when I make mine. Across the back, the most recent flyer from Tim Holtz, preprinted sentiments, 2 new punches from WeR Memories that I got off clearance last week, cards in envies I've already completed and the paper keepers holding the Recollections cardstock and all of my Christmas DP. In the far ground, the card blanks. I my SU cardsstock for my artistic friends who appreciate the love that went into them. Today's post is monumental for me. 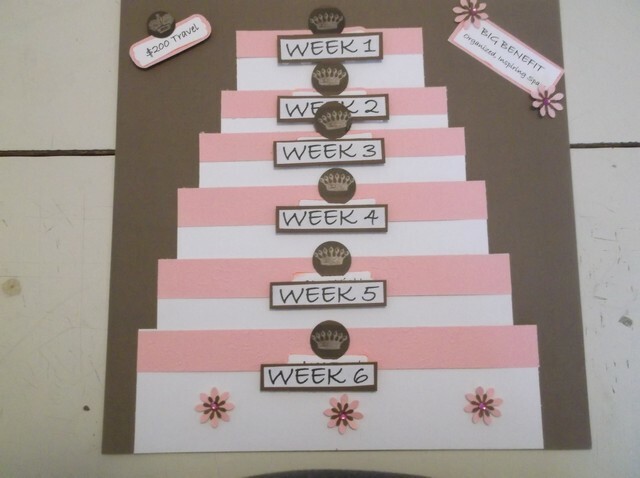 Not only did I get to make a card but this one also applies to a challenge on the Stamp2Spend Challenge on SCS. 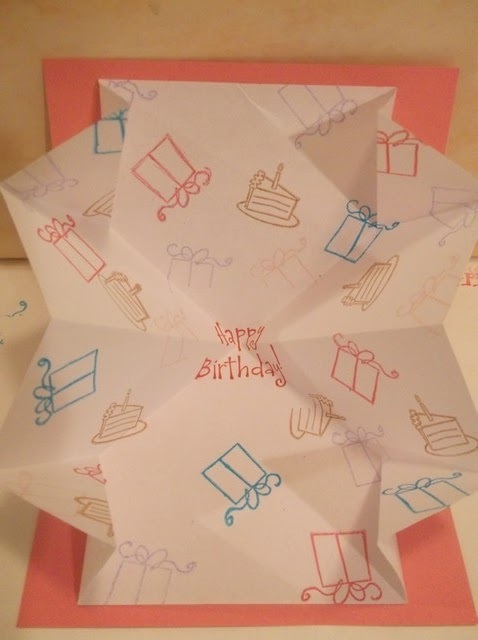 I knew when I saw an Explosion Card, that it was the perfect one for my granddaughter. Abby turns 4 years old on Sunday. Just does not seem possible that only four short years ago I was taking the little bundle of blessings from the nurse and presenting her to her daddy. While the card is all girly, her present is a set of hot wheels with a launcher and track. LOL Just like Adrian, she is at that car stage. I think because they are small and easy to fit in her little hands. Portable toys are always a good thing. Now, I don't want anyone to faint, but I will be back tomorrow for WOYWW to show you my latest project.